Deciding what items to take with you on your vacation (and what to leave behind! ), is an important part of good travel planning. The climate of your destination, the activities you plan to participate in, and the duration of your trip will determine what you should pack. Resist the temptation to pack non-essential items. 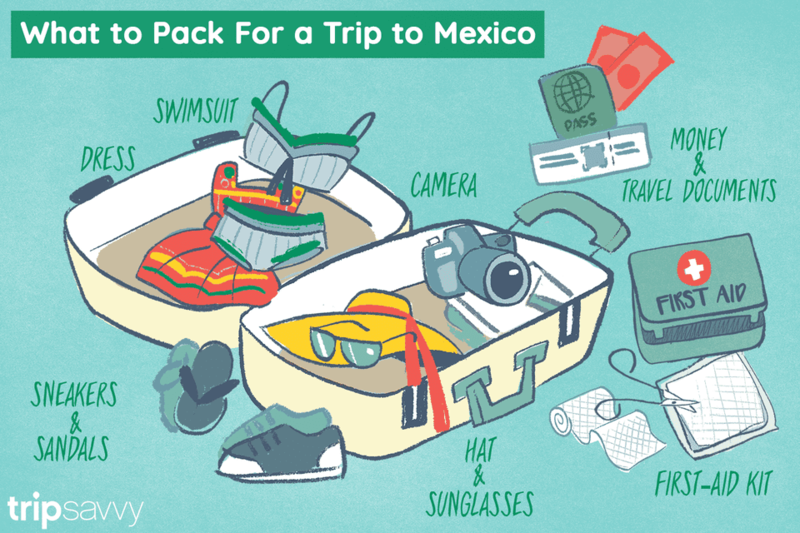 You will probably be able to find any things you may need in Mexico, though perhaps not the brand names you are used to, and when getting from one place to another, or dealing with airport baggage restrictions, you'll be happy you didn't overpack. If you're traveling by air, keep in mind there are some things you may not be able to bring in your carry on, such as liquids in a container over 3.4 ounces and sharp objects such as razors. Check the airline regulations about your luggage allowance and the TSA regulations for what's allowed in carry-on. Consider the climate of your destination. Many people assume that the weather in Mexico is hot all the time, but this is not the case. Locations at high altitudes such as Mexico City, Toluca and San Cristobal de las Casas can be quite chilly at certain times of the year. Also consider whether it's rainy season, in which case you may want to pack a rain jacket or umbrella. At beach destinations, casual clothing is generally acceptable whereas in Mexico's colonial cities somewhat more formal dress is the norm. Avoid short shorts and halter tops in Mexico's inland destinations. Read more about what to wear in Mexico. Here is a list of things you may consider taking with you. This packing list should be used only as a general guide. Don't take every item on this list; determine what you will need based on the considerations mentioned. Choose your type of luggage depending on how much you're going to take with you and whether you'll have to walk far with your luggage. A suitcase with wheels is a good idea for navigating through airports, but may not roll smoothly on cobblestone streets, so you may want to choose a backpack or convertible bag. Besides your suitcase or backpack/duffle bag, you should also have a day pack or shoulder bag to carry snacks, bottled water, maps, a camera, and anything else you may need on your excursions. A money belt worn underneath your clothing is a good idea to keep your documents and money on you while traveling from place to place, but do make use of your hotel safe when you can. Make sure there's some extra room in your luggage, or pack an extra light-weight bag if there's a chance you may purchase handicrafts or other souvenirs. Depending on the length of your trip, either bring an outfit for each day, or plan to do laundry. It's easy to find laundromats and dry cleaning service in Mexico, and you can also wash a few light weight items in your hotel sink. If traveling by air you may take three-ounce bottles of liquids and gels in your carry-on, the rest should go in your checked luggage. What's a Mexico Tourist Card and How Do You Get One? Do You Know These Basic Facts About Mexico?